All camps are limited to 9 students and are, half-day, daily or week long. Being creative can make you hungry & messy, so please have your child/teen bring a snack for break time and clothes they can get paint on. We also do art outdoors and go to the park to get inspiration from nature. Therefore, please have your child/teen bring appropriate clothes for the weather, such as a hat, jacket, sunscreen and walking shoes! 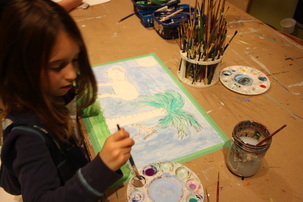 Register for Spring Art Camps now! If your child is 5 please choose either the 9-12pm camp or the 1-4pm camp. This program is not designed to be full-day. This camp is for young children who are comfortable being in a half day activity without their parents. Students will be making lots of different kinds of art, such as painting, drawing, printmaking, collaging and sculptures! There will also be time for snacks and outdoor play at the park behind the community center. 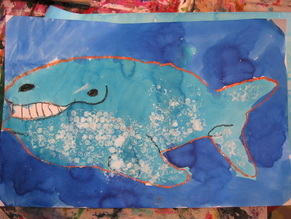 This camp is for children who love to paint, draw, sew, sculpt and make prints. We will teach students technical art methods while encouraging lots of creativity! 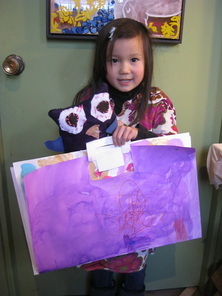 Students make portfolios to hold their art and create new friendships while expressing their unique artist abilities. This is perfect camps for kids who are up for anything and love to make different kinds of art!